Pitted travertine walls, coconut furniture, leather roses, even a stingray staircase feature in the unique aesthetic of the 58 metre Benetti superyacht Illusion V. Yet thanks to designers Tina Green and Pietro Mingarelli, she is a relaxed home for a young family as well as a statement of style. 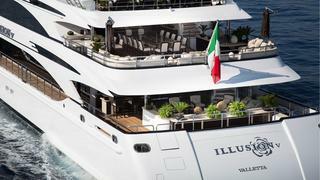 When we first step aboard Illusion V, Lady Tina Green is about to burst with excitement: “I’m like a child. 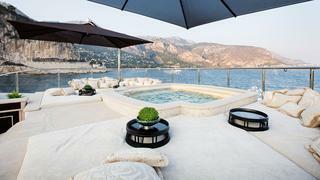 I just want to jump up and down,” she says, ushering us proudly around the yacht. Illusion V was designed inside and out by Tina Green and her business partner Pietro Mingarelli and the pair had spent the last two weeks camped in a chase boat at Benetti’s Livorno facility, urging the build along to make sure everything was completed in time for the show. The exterior style is a fusion. There’s some Bali in there, as seen with the use of coconut and mother of pearl on the external furniture, a hint of ancient Rome in the copious use of travertine and even some Thai, evident in the pen shell ornaments and wooden Buddhas. But the central theme – the symbol most prevalent – is the simple rose. Whether embossed, engraved or embroidered the motif is unavoidable, with details of the flower evident in everything from cushions to carpets, walls to windows. “The owner saw what Pietro and I have done with Lalique Maison, and how we had used the rose motif,” explains Lady Tina Green, “and he liked it so much he wanted us to make it the major theme on his boat.” As well as working on yachts and houses, Green and Mingarelli also design and produce a collection of furniture and accessories that make up the lifestyle arm of Lalique, most famous for its glass and crystals. No fewer than 480 crystals are used on Illusion V, in the floor, ceilings and walls – all carrying the rose. You’d think the design might become repetitive but the duo have cleverly avoided monotony by playing with the shape as much as possible. For example, cushions are covered in scattered petals, while the staircase features leather walls embossed with the full three-dimensional beaded flowers. It’s like this on all Lady Tina Green’s yachts: they start with a single theme, whether a flower or, in the case of a 65 metre she designed recently, an antique woodcarving picked off the floor of a market in northern Thailand. The other thing that strikes you about her designs, particularly Illusion V, is how comfortable they are, probably a consequence of Tina Green living on a yacht up to six months a year. Thanks to this lifestyle, she knows what works and what doesn’t. Small wonder clients trust her judgement. It’s a measure of this client’s confidence in Green and Mingarelli that he didn’t visit the yard once during the build. “I saw the boat for the first time this weekend,” he tells me. “They did an amazing job. 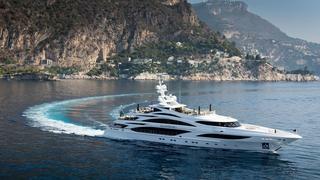 When my wife and I met with the designers originally, we told them how we wanted the yacht to feel. I didn’t want lounges where you were too scared to sit on the sofa, I wanted to feel at home. They managed to pull it all together plus our requests for certain colours and a certain vibe – casual and relaxed. 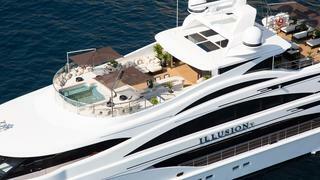 Guests get treated well, too, since it was important that Illusion V had a successful charter career. The big VIP cabin is on the lower deck, occupying the full beam of the boat and has the only bathroom outside the owner’s with the full white-onyx treatment. Four roomy guest cabins sit in front of it: two doubles and two twins (the twins could almost be doubles, so wide are the beds). Discreet but voluminous storage is in all cabins: “One thing we’re very known for is our hidden cupboards,” Tina Green says. All the requisite A/V is tucked neatly away in the guest suites. “You need your big media, you want your remotes to do everything, you want enough plugs to charge your phones, you want your Apple TV,” the owner tells me. “It’s all got to be there but you don’t want it in your face.” Unless, that is, you do. The spiral staircase leads to another area that will have the charter market frothing: a cinema room with sofas so deep they’re writing poetry. The upper deck is where the after-dinner action will take place. There’s an option to turn the area into another large cinema space, with a big screen that rises out of a sideboard, although people are more likely to cluster around the bar – one of five on board. If the party ends in the upper deck lounge, it starts up top. The sundeck of Illusion V is spectacular, offering clear uninterrupted views from the rear sunloungers to the raised foredeck spa pool. Better still, it’s all on a single level and incredibly versatile. 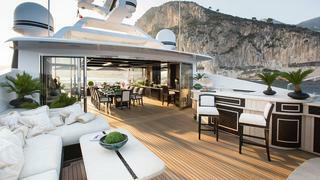 In the middle of the deck is a dining area that seats 12. Clear doors fore and aft can be opened or closed depending on the wind, making this a year-round, all-weather dining space. Forward is another bar, panelled in matt coconut and embellished with travertine – while the chairs in front of it, also made from coconut, are highly lacquered with mother of pearl inlays, “for that feeling of luxury”, explains Tina Green. As with all the external spaces, the plants up here offer a contrast to the warm beige palette and give life to the decks. 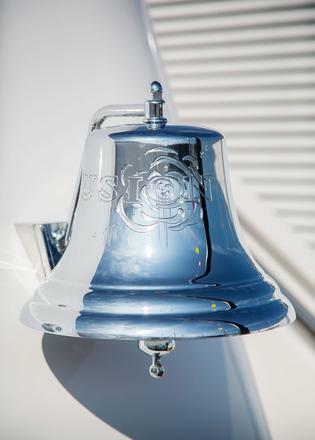 The textures and materials throughout the yacht are something of a G&M speciality. All the exterior dining chairs are made of coconut and mother of pearl, with chenille fabrics, for instance. “No one else is doing this,” she says. “We made coconut sophisticated!” All the loose exterior furniture was made in Bali, and Green and Mingarelli posted their own experts there to lacquer it. Elsewhere, parchment – goat skin to the uninitiated – is used to give depth and texture to coffee tables, including the enormous one in the main deck saloon while shagreen (stingray skin) is used on the upper deck side tables, coffee table and panellings on some of the fixed furniture. This focus on design is fine so long as the boat works. The owner admits he is highly sensitive to movement and noise: “Honestly, I’d rather be on land! So it’s important the boat is incredibly stable and quiet. When I got on board yesterday, I said to the captain the boat was listing two degrees to the right. He came back and said, ‘Yep, it’s listing two degrees to the right.’ We’ve had lots of people working with Benetti to make sure the boat runs smoothly, quietly and with no vibrations. All these technical things have been completed to a different standard than before. With the boat sitting at the show, it’s hard for me to gauge how successful Benetti has been in this regard, but following successful sea trials, it obviously went well, and she is now heading off to the Caribbean, where the owner will join the boat with his family for Thanksgiving. After that, she’ll head back to Europe for the Monaco Grand Prix. “That’s the plan, anyway,” the owner says, estimating he spends about three months a year on board.